improving weather allowing for more outdoor recreation. Helping to kickstart the whole month and the summer season is the May Bank Holiday weekend with the leisurely Monday thrown in to make a long weekend more enjoyable and wider travel arrangements possible to sample the fare at the many festivals on offer. In recent years during the enduring recession in Ireland, there is a delicious irony around the collapse of the banking institutions and bankers who enabled the downward slide relying now on the closure of banks for a day to create the myriad three-day festivals in the country. It is the hope that they will encourage cultural tourism that would not only attract many visitors from abroad (the U.S., Canada, Europe and Asia mostly) with their greater spending potential, but also bring out the Irish folks whose budgets no longer allow for distant shore visits but look for staycation scenarios. These local festivals afford the opportunity to provide jobs and money for local hostelries, businesses, workers and musicians, all of whom count on these wonderfully organized festivals to help them survive in these tough times. On the May Bank Holiday weekend (first weekend in May) there are quite a few very well curated trad music festivals that one could go to and sometimes the choices can make it tough to decide where one wants to go. While the decision can be difficult, it is best to make one choice and not try to hopscotch around to more than one as you lose the opportunity to savor why each of them has sprung up and, in many cases, have remained a multi-year attraction. A two or three day sojourn (or more if you can manage it) in a town gives you the opportunity for strangers to become friends, and also allows nearby daytime touring usually in very picturesque settings. While it is not quite a “bucket list,” many of these festivals are on my radarscope for my occasional visits to the Old Sod because I have heard tell of them from many musicians who proclaim their worthiness to fans of traditional Irish music. On the May weekend past I could have gone to Louisburg in Mayo, Carna in Galway, Abbeyfeale in West Limerick, Ardara in Donegal or Monaghan Town in Monaghan (actually I stole a day there after arriving in Dublin to see the Voice Squad as I wrote about last week), all featuring sensational programming day and night to satisfy the trad fanatics and anyone who simply enjoys great music in a community atmosphere that embraces it. But it was the call of the cuckoo that lured me this year and the Fleadh na gCuach (Cuckoo Fleadh) now in its 19th year in the charming seaside village of Kinvara (Cinn Mhara) at the mouth of Kinvara Bay, an inlet of Galway Bay. 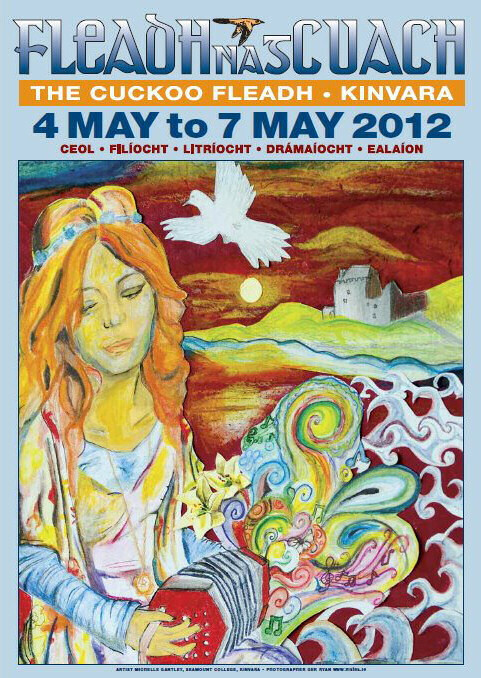 The cuckoo’s return to Ireland signals the return of summer as well as this festival (http://www.kinvara.com/cuckoo/index.html) celebrated annually. Given its close proximity to Galway City which lies directly opposite Galway Bay and the Clare border and Shannon Airport, Kinvara has served as a magnet for the artistic community and many musicians (including Steve Earle and John Prine from America) over the years, including my hosts Dermot Byrne (of Altan) and Floriane Blancke, a French harpist. Alec Finn of DeDanann fame lives in a castle in Kinvara, though not Dunguaire Castle where Irish banquets are held during the tourist season. North Clare’s Burren Country is a dramatic drive not far away, and in August Kinvara also celebrates the famous Galway Hookers and the Gathering Festival of the Boats. It will also be a convenient place to view some of the sailing exploits of the internationally famous Volvo Ocean Race ending in Galway City in July right before the Galway Arts Festival and races. Back in November 2010, I made a pilgrimage to a tasty Sunday night session in Connolly’s bar to hear Mary Staunton and Mary Shannon, and during my brief overnighter I was encouraged to come back for the Cuckoo Festival, and so I did at my next opportunity. In fact, the owners of the colorful and antique-laden pub at the corner of the Quay, Olga and Cathal Connolly, are central to the organization of the Cuckoo Fleadh and very amiable hosts as well for the music sessions. The numbers attending it or the venues wouldn’t be huge, but the character of the village is certainly magnified by the large number of musicians who are drawn to it and its 45 music sessions over a four-day span, the sign of any good traditional music festival. One of the more prominent sessions was a Saturday afternoon launch of the new CD by Byrne and Blancke featuring Irish music on accordion and harp, an unusual combination but one that blends very well together. French harpist Blancke, who moved to Ireland to study Irish music. They have created one of the fresher musical releases out this year which will be one of the featured CD releases in the Catskills this summer (www.catskillsirishartsweek.org). One of the local Kinvara musicians, fiddler Maire O’Keeffe, is also a big fan of Cape Breton music and has many close ties with traditional musicians from that region including the MacDonald Family. So the sire of the musical clan, Lloyd and sons Paul and Danny (and son Michael who was their driver) descended on the scene once again to participate in a few sessions, including one gorgeous one on Monday afternoon anchored by O’Keeffe and Elish O’Connor at the Pier Head Pub and Restaurant perched at the end of the Quay with a view out to Galway Bay. At one point eight fiddlers played away in unison while Mary Staunton, herself a wonderful Mayo musician on accordion and vocals living down the road in Oranmore, sat in rapt attention. Moments like this are lasting memories. The weekend drew to a close at Connolly’s, where the remaining musicians congregated as the weekend visitors diminished and it was down to the faithful. It was a pleasant surprise and bonus for me to be able to see and hear Paul O’Shaugnessy from Dublin there as well, one of Ireland’s finest fiddlers who has a holiday home there in Dorris outside of Kinvara near Byrne and Blancke. The Cuckoo Festival is one of many examples in May and year round on those roads to be taken off the main motorways that can bring unparalleled enjoyment and cultural enrichment. And increasingly Bord Failte or Tourism Ireland are recognizing them with support because they are aware that festivals and events bring people over to share what Ireland has to offer. Next time you are planning to “Jump into Ireland” as the new slogan suggests, you can find many a place worth visiting all year round at http://www.discoverireland.com/us/about-ireland/experience-ireland/festivals-and-events/arts-and-cultural-events and perhaps you can start your own traditions.